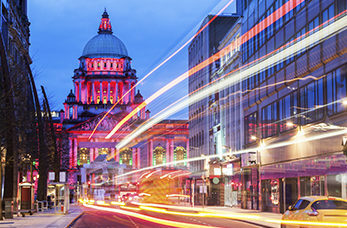 Belfast is the capital of Northern Ireland, the port is famous as the birthplace of the RMS Titanic. Today this graceful city is packed with Victorian and Edwardian buildings, history, culture, great food, and friendly locals and has become a cosmopolitan tourist hotspot. Visit the Giant's Causeway, a spectacular landscape of basalt columns set on a rugged coastline that attracts visitors from around the world, its often described as the Eighth Wonder of the World. The Titanic Memorial Garden is located on the east side of Belfast City Hall, it was designed by Sir Thomas Brock to honour those who perished on the RMS Titanic. Explore this nineteenth century fortified prison and experience what life was like for the prisoners through the ages as well as the dark secret that lies within its walls. Built by Norman John de Courcy in 1180, Carrickfergus castle is considered the first real Irish Castle. Today it features historical displays as well as cannons from the 17th to 19th centuries.